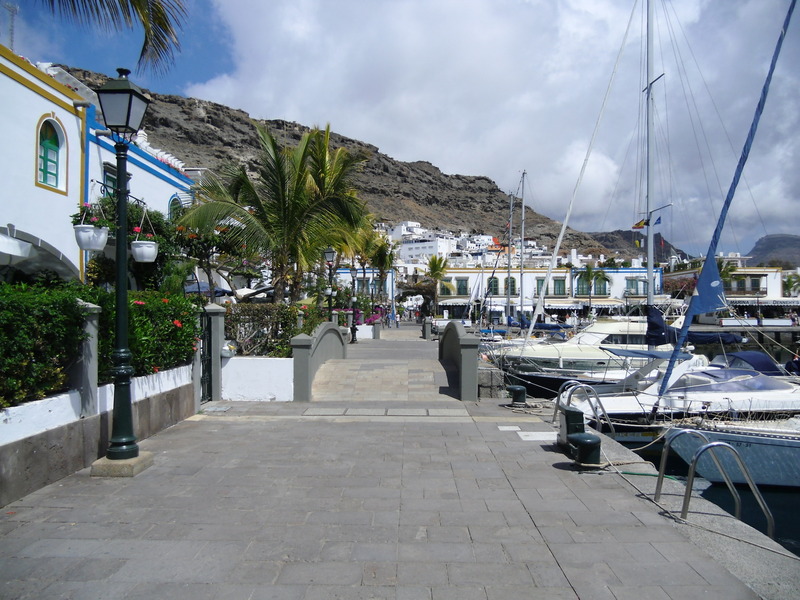 Puerto de Mogan is also known as "Little Venice". We visited the "Big Venice" the year before and now we wanted to know how this "Little Venice" looks like. 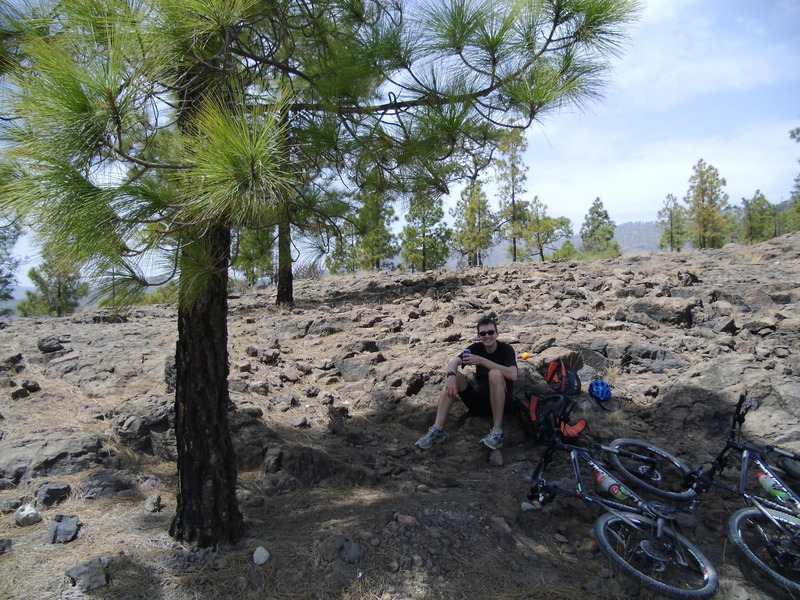 Actually we wanted to cycle from Maspalomas to Puerto to Mogan, but the guy at the bike rental told us that it is not allowed to cycle on the road between Puerto Rico and Puerto de Mogan, because it has a long dark tunnel. 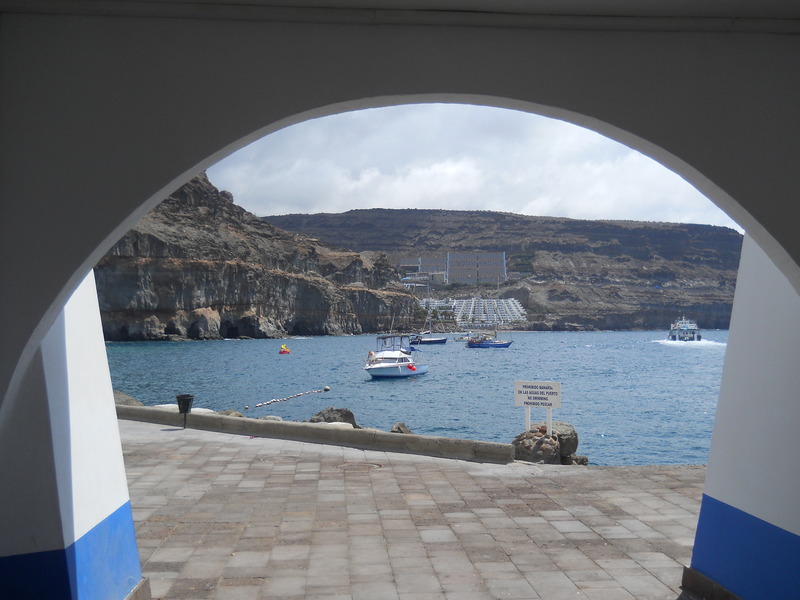 We had a look at the map and saw that there was a ship going from Puerto Rico to Puerto de Mogan. 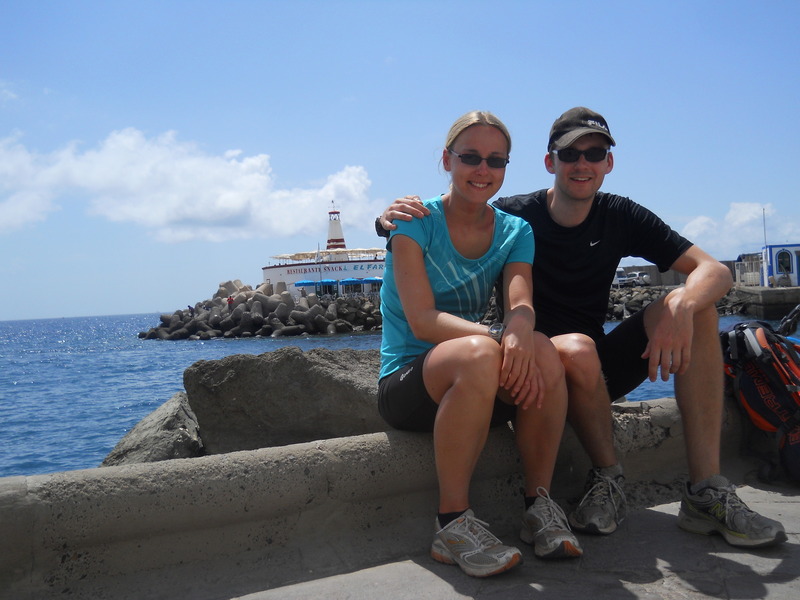 Therefore we took our bikes and cycled up to Puerto Rico. Actually the street next to the coast is quite nice, it goes always up and down. But after we passed Arguineguin there was a lot of traffic. That was not very nice. But after about one hour we arrived safely in Puerto Rico. 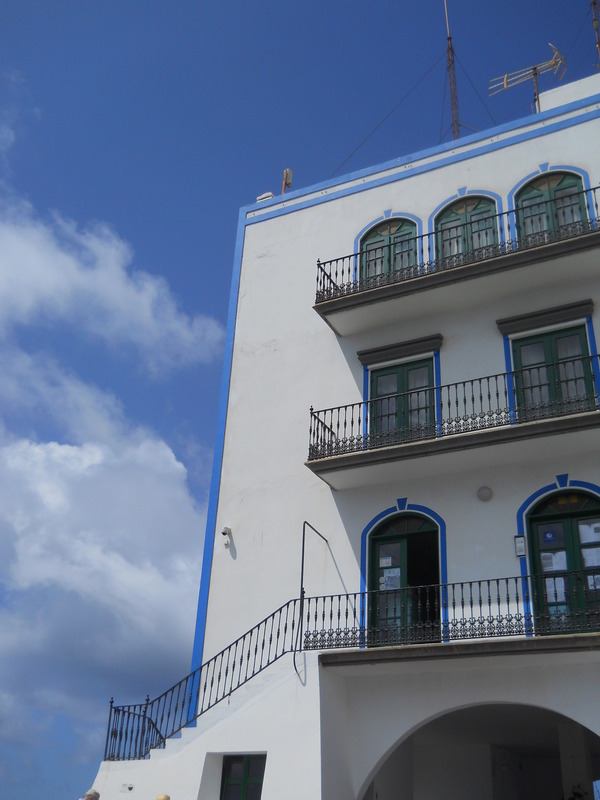 Puerto Rico looked a lot different that what we expected! There were huge hotels and no real beach. Instead of a beach there was a lot of concrete. 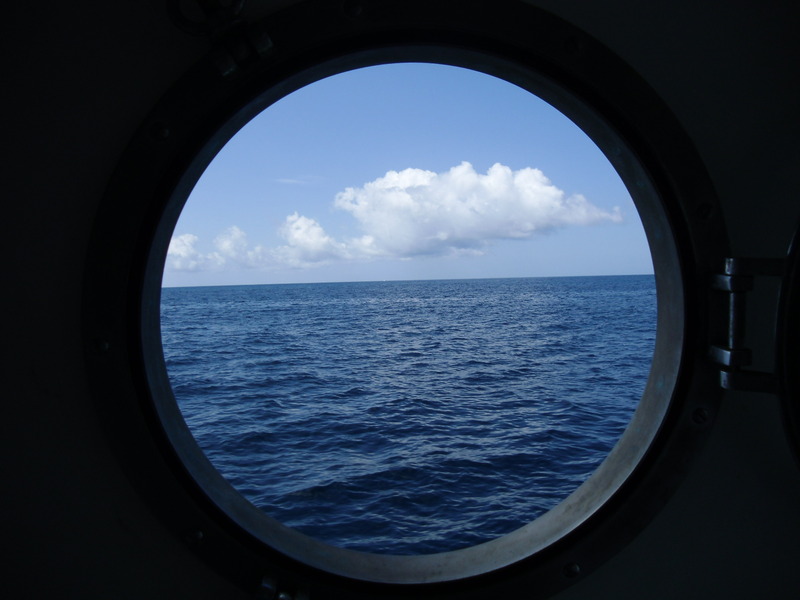 So we had a break and looked for the ship. We could find it and it was no problem to take the bikes with us. 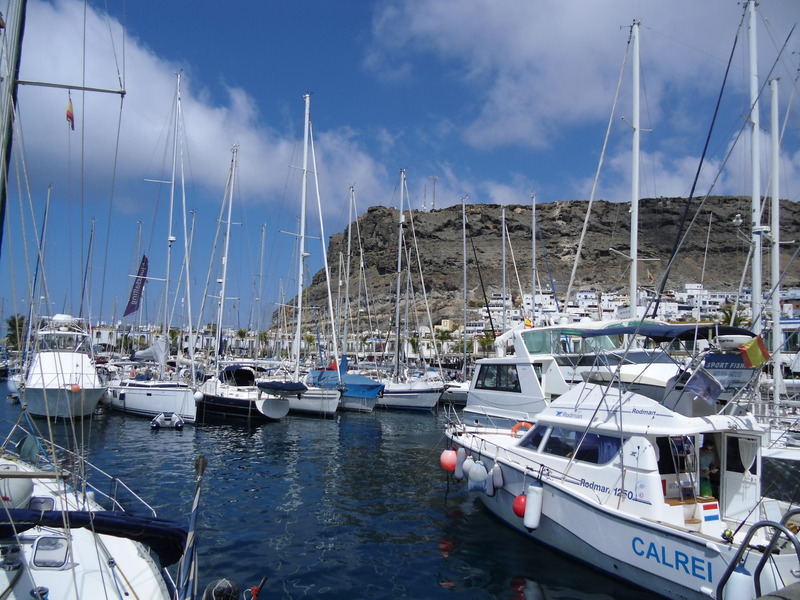 So we took the next ship to Puerto de Mogan. It was shaking a lot! 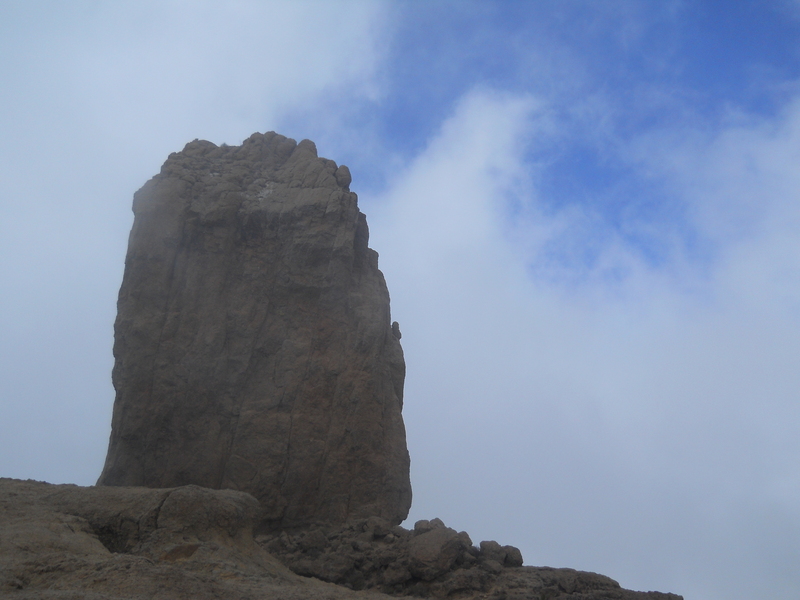 Our goal today is Roque Nublo (1803m) which is more or less located in the centre of the island. 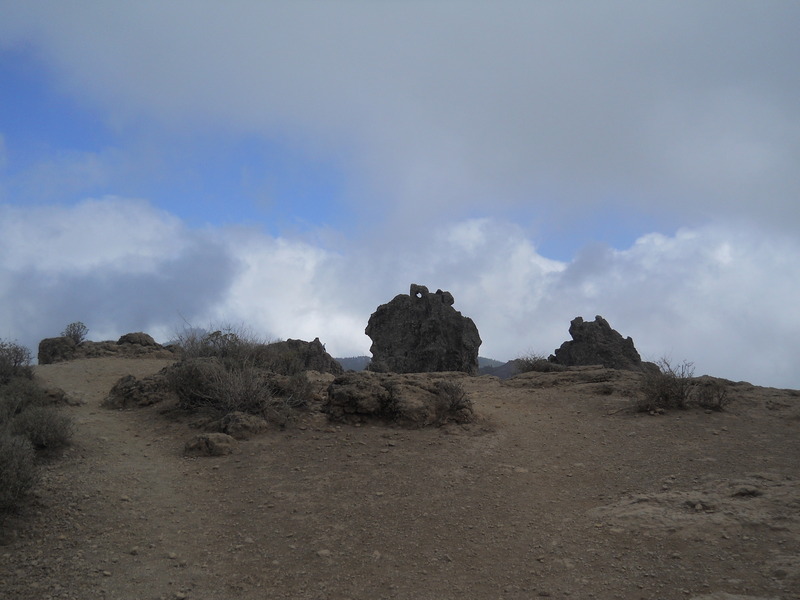 We start in Maspalomas at almost sea level. 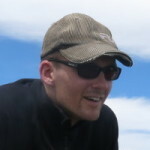 That means we have ~1800m uphill and 1800m downhill to go. We decide to take enough water and enough food with us – all in our backpack. 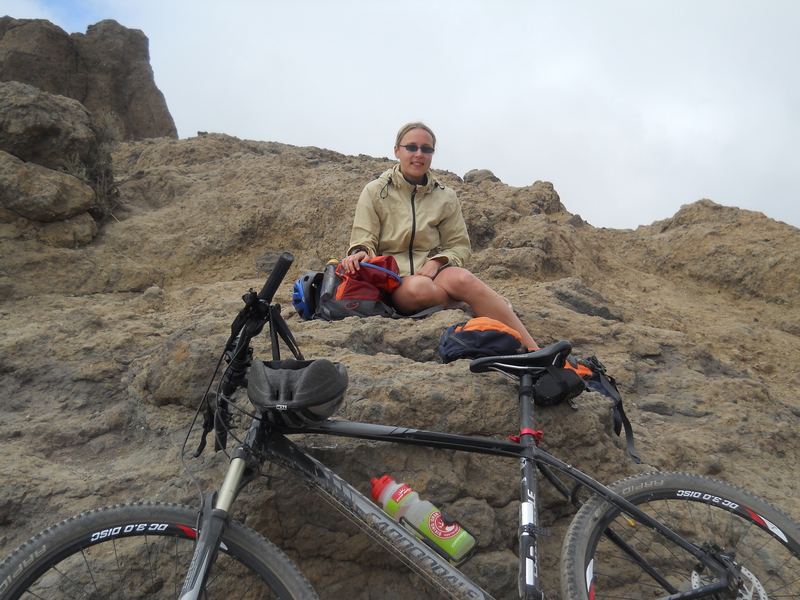 We take road GC-500 and change to GC-505 shortly before we reach La Playa de Arguineguin. This morning it is cloudy and hence it is not so warm, yet. 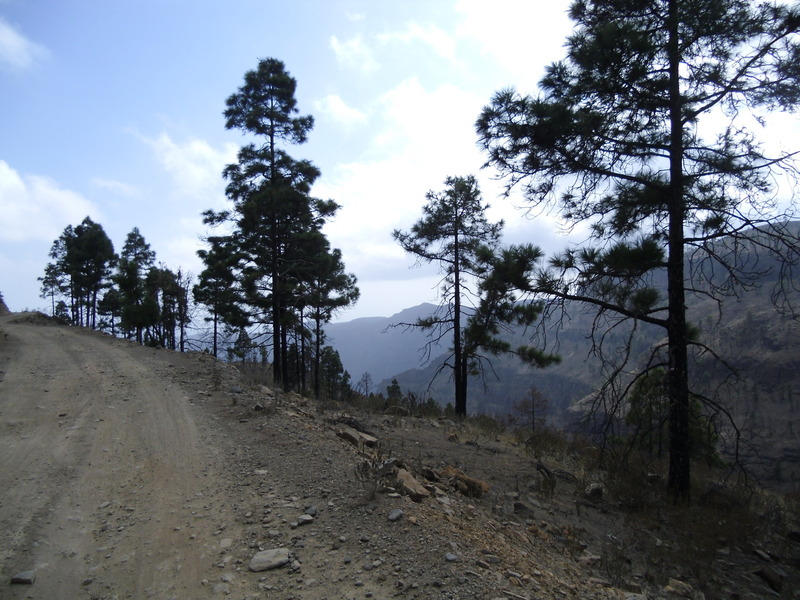 We follow GC-505 for approximately 11km until we reach Cercado de Espino. There we take a short break. Up to now the road was quite flat. 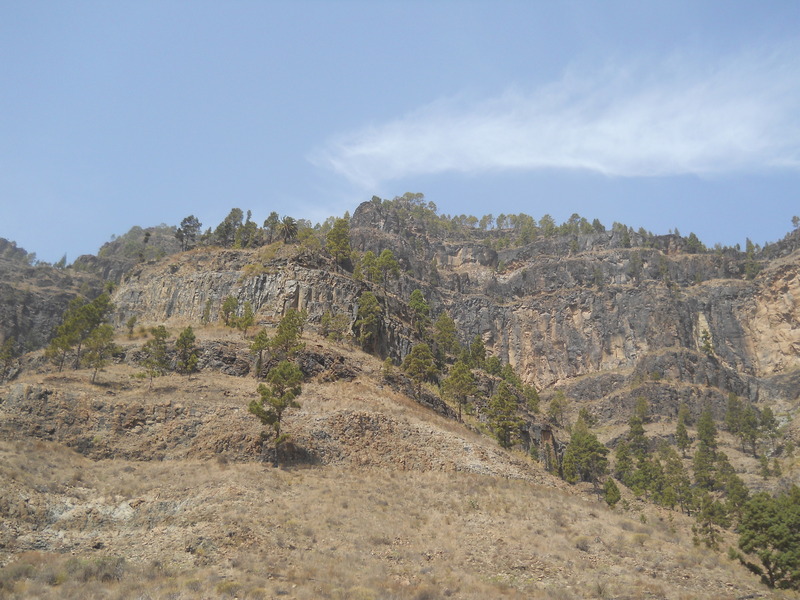 The next 7 kilometres will be quite ascending – up to 14.6%. We don't race up there this morning since our goal is still far away. The sun gets out sometimes, now. 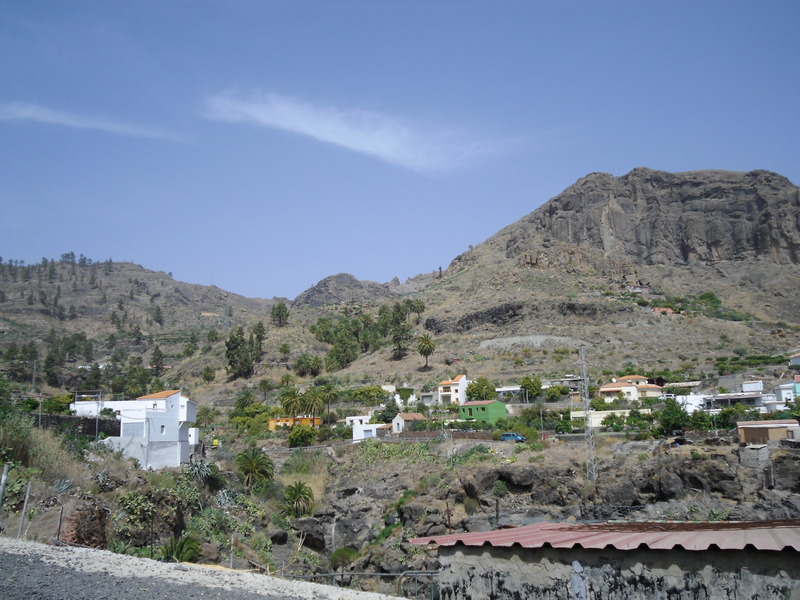 Our next break we have in El Barranquillo de Andres. 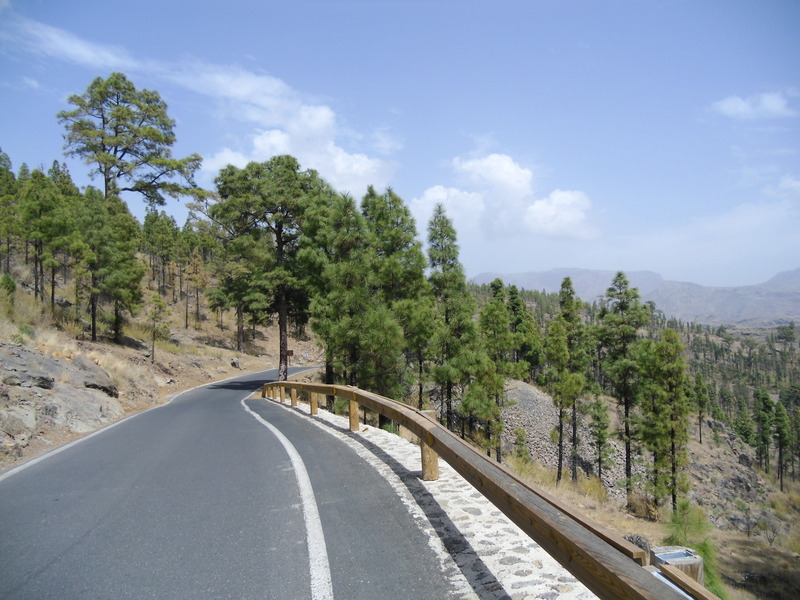 There we leave GC-505 to the left on road Lugar Barranquillo Andres heading to GC-605 (link). This part of the road is also quite ascending but it is even nicer than the first part of the course. The road is less broad and there are almost no cars going up there. 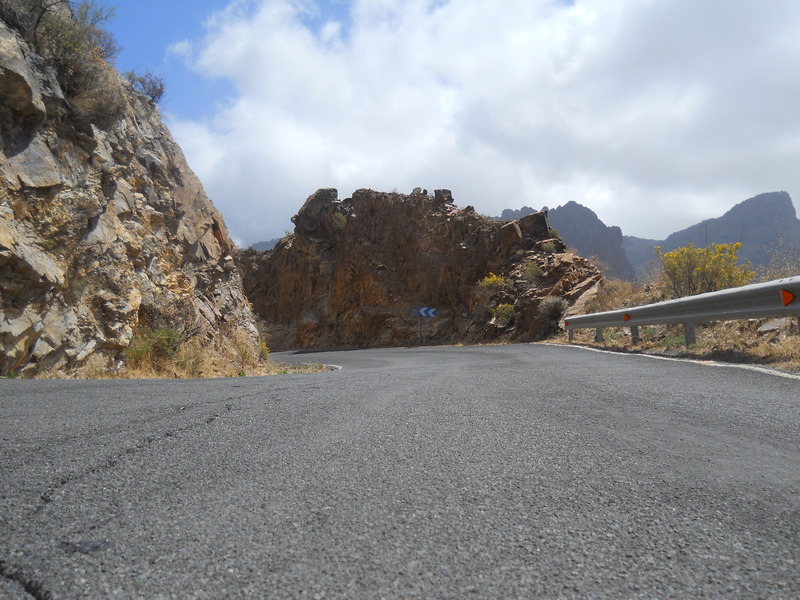 We follow the road up to Lugar Barranquillo Andres (link). Here we take another short break. From that point it is less steep – at least for the next kilometres. We change to GC-605 on the right (link) and cycle further up the hill. We wonder if we will see the natives selling fruits and drinks up here again. And there they are – but this time there are quite some more customers around. This time we don't take a break but continue on road GC-605. 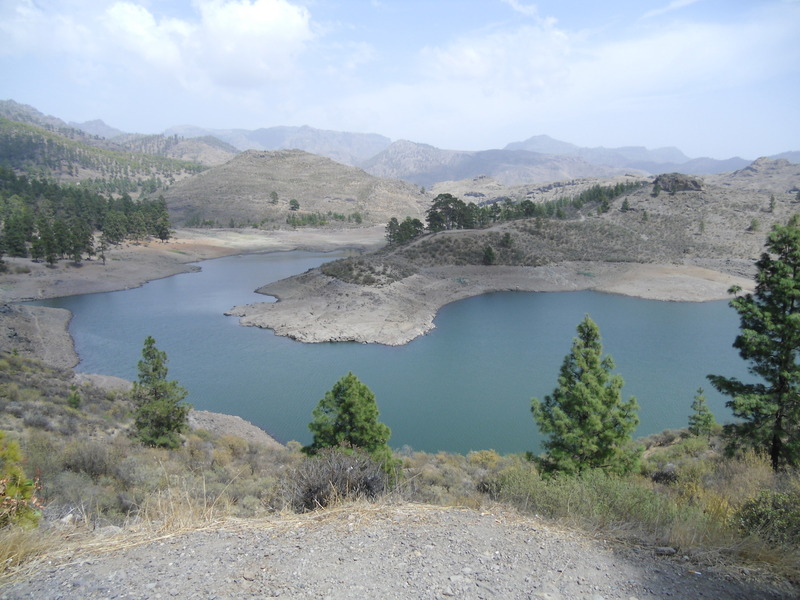 To the right we see lake Embalse de la Cueva de la Ninas (link). Then the road gets little steeper again. Now, the sun burns down on us and we are glad that we have enough water with us. This road seems to be endless. From time to time a car passes. 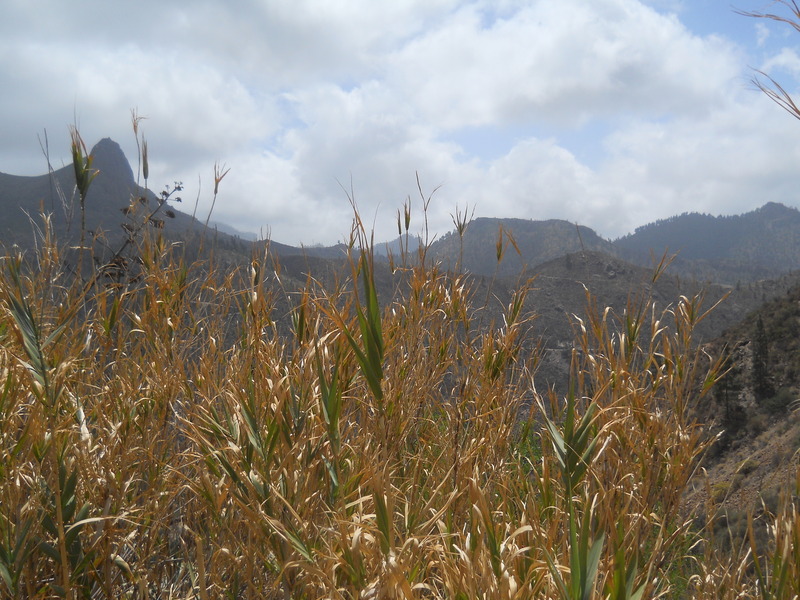 Finally we arrive in Ayacata located beside road GC-60/GC-811. 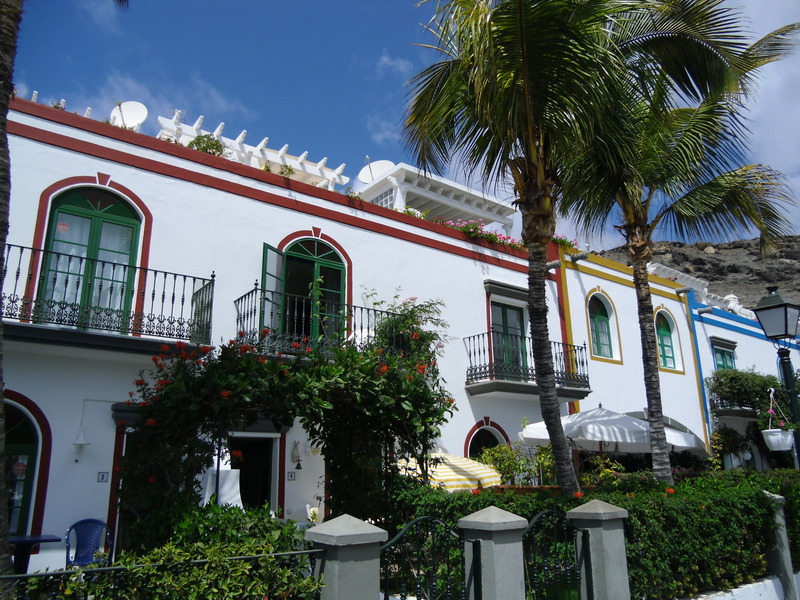 Ayacata has a small bar (Bar Casa Melo) (link). This is a place where we may have bought some water but since we didn't know if this place was even open we had to carry all the water up here on our own. Anyway.... We take a short break again. Then we are ready for the final ascending. We turn left on road GC-600 (link). 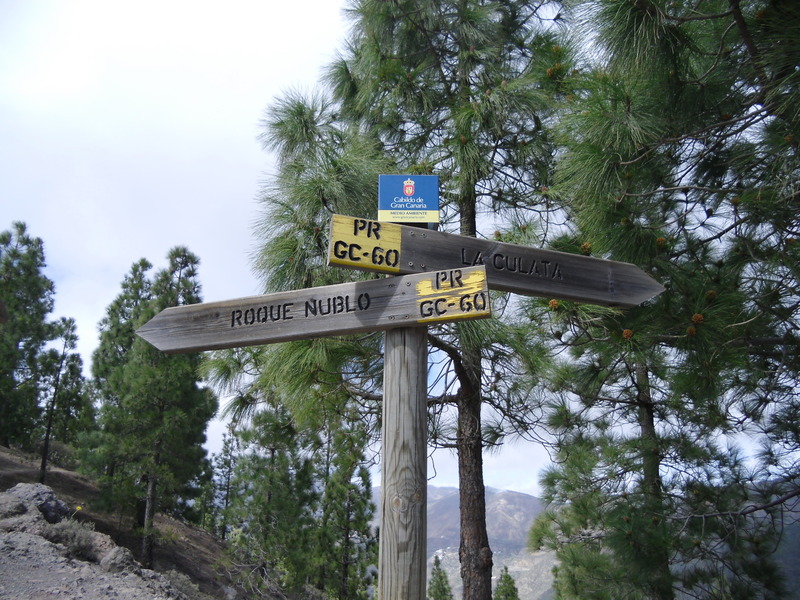 The sign shows “Roque Nublo”. 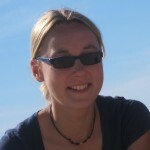 We feel that we are quite close to our goal. The last few kilometres are again quite steep. The number of turns seems to be endless and our legs are getting tired. 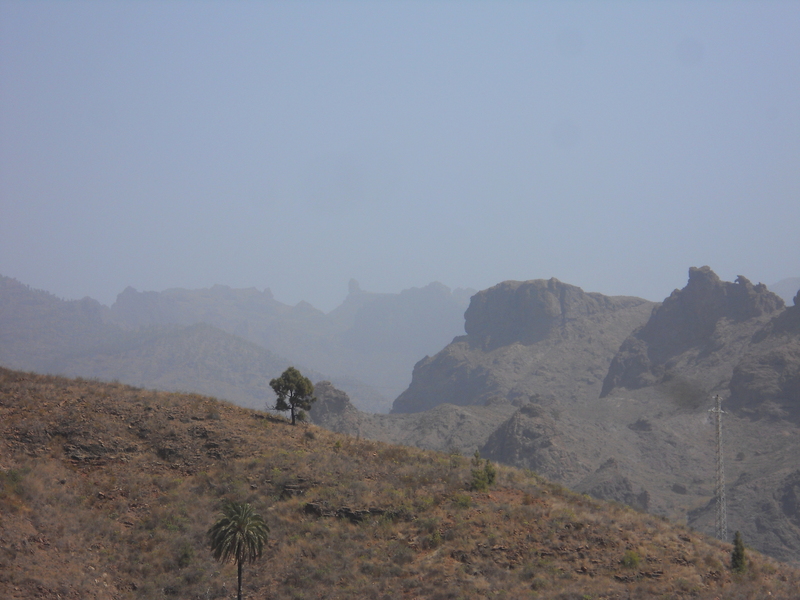 Finally... we arrive at a parking site and a sign saying “Roque Nublo” (link). After eating up almost all our food we carry our bikes back to the road. 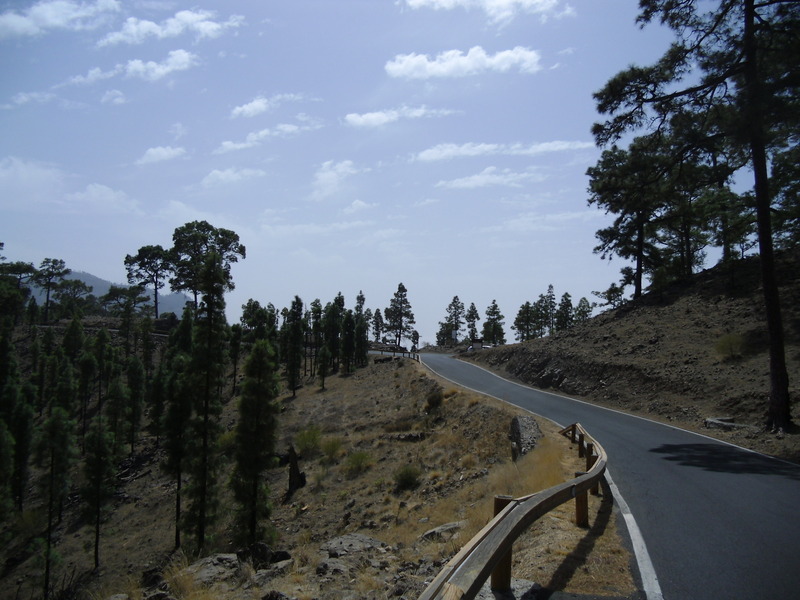 Our plan is to take a different route back to Maspalomas – using road GC-604. 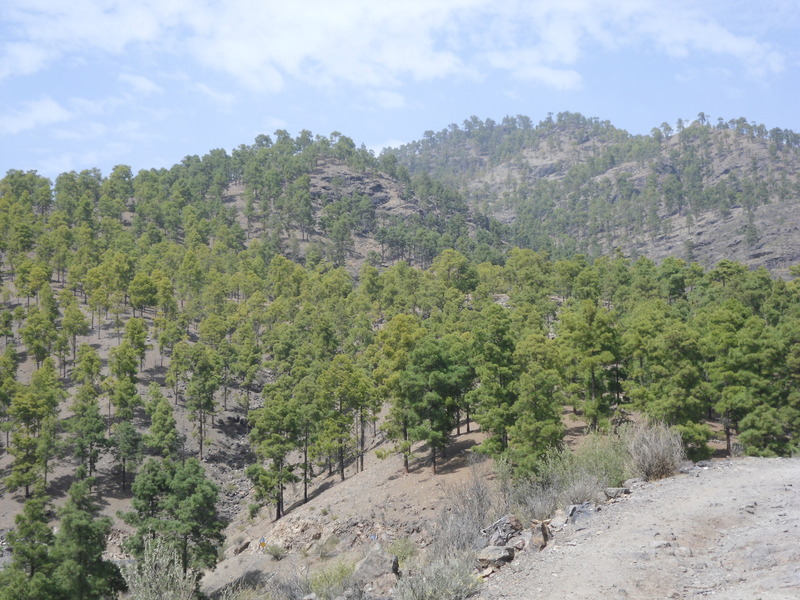 This will lead us through Los Cercados (located beside a barrier lake), through the woods and a lonely road back to Degollada de Tia Maria Diaz which is quite close to Maspalomas already. It should be mentioned that the part through the woods should only be cycled with a mountain bike. 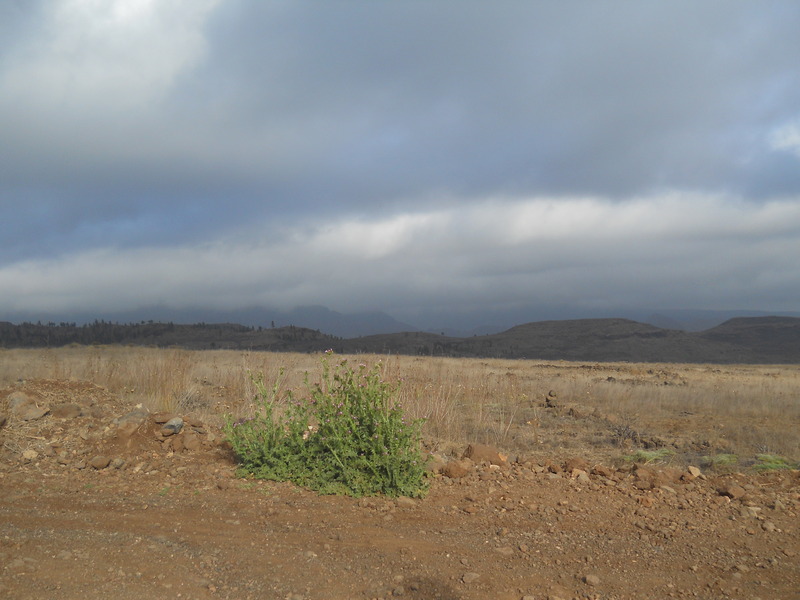 And so we are rolling down the road back to Ayacata. There we turn left and follow road GC-815 further down to a junction (link). There we turn right on road GC-604. This road is also very nice – feels a little like being in paradise just rolling down the road and looking down onto the lake. 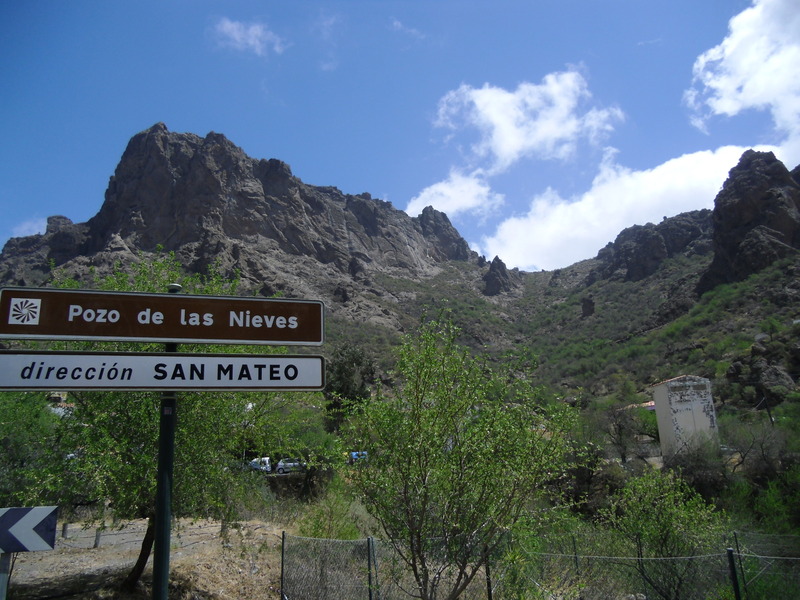 Soon we arrive in Los Cercados. We pass this small village which seems to be at the end of the world. We follow the road which finally changes to some kind of path. From this point a mountain bike is quite helpful. We cycle up the hill until we reach the pass. From this point it just goes downwards... and we are really happy to have mountain bikes (watch our video). After an hour or so the path turns back to a road again (funny thing is that this “road” has the same number – GC-604 – all the time). Rest of the way home is just road – and it goes downwards almost all the time. 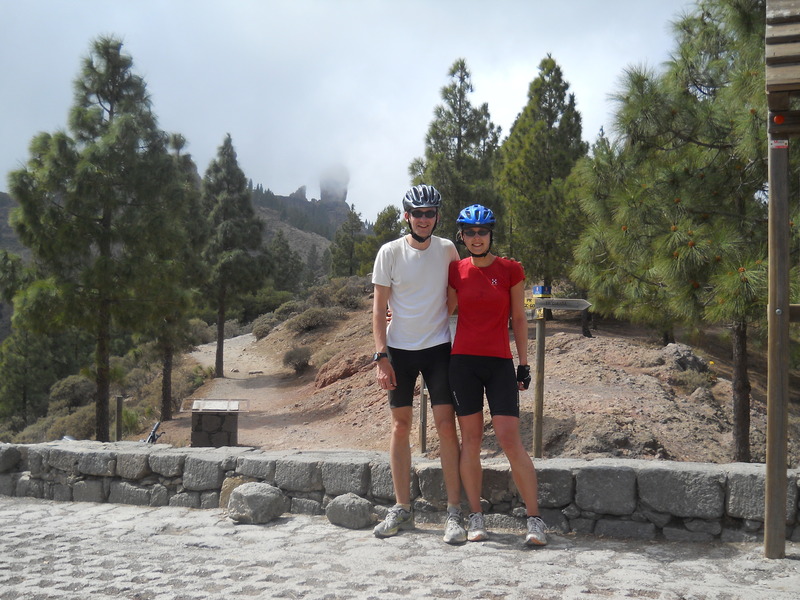 Back at the hotel we can hardly move any more 🙂 After 10 hours and ~3600m up- and downwards we are just looking forward for the buffet and for the bed 😀 Looking back this was the longest but also most amazing cycle tour we did so far on Gran Canaria. 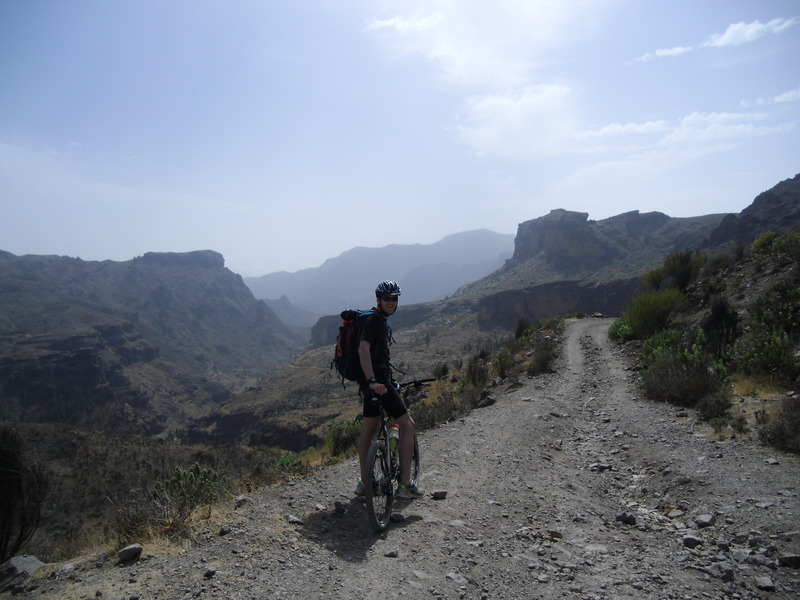 During our last holiday on Gran Canaria we cycled to Soria and back. 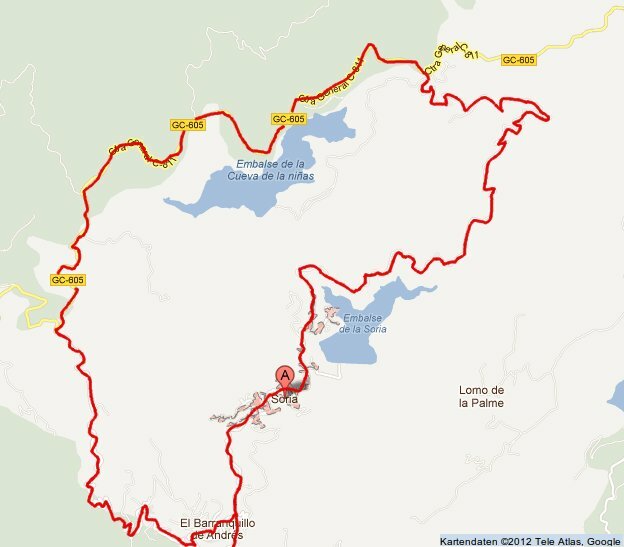 But this time we wanted to know what happens when we continue to cycle uphill just before Soria. 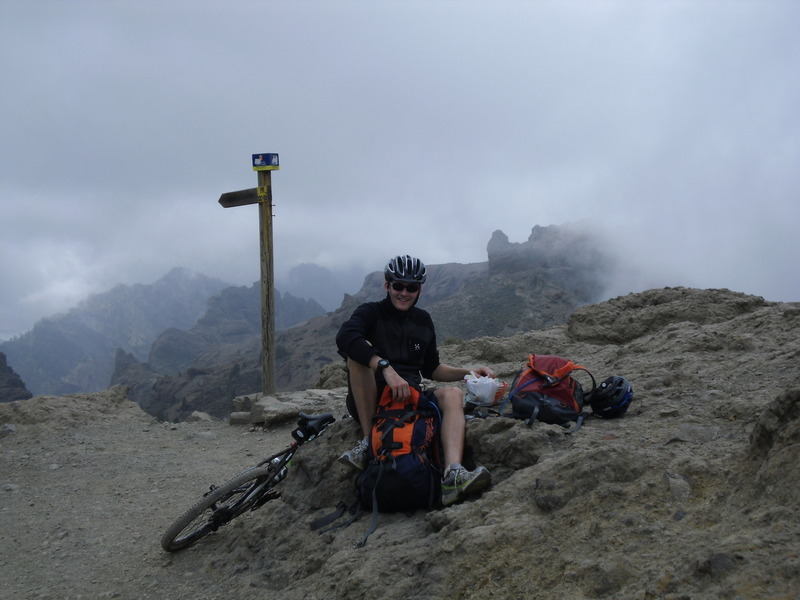 After the many kilometers steep uphill, before Soria we turned left and continued cycling up. The road was very nice, almost no cars and a nice view around. 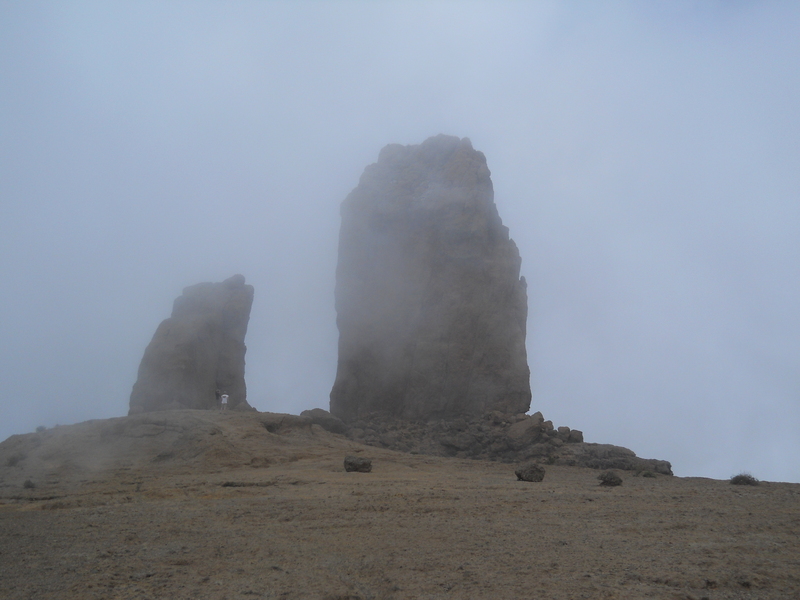 After a long and hot ascent we started to think about going back the same way. Our map said that there would be a path down to Soria from the other side and actually it would be really nice to take this path back down, so that we do not have to cycle the same way back, but we do not really trust this map.. and maybe the path is even too small to be cycled. But just when we thought about giving up and cycling back down we came around one turn and saw a kiosk! 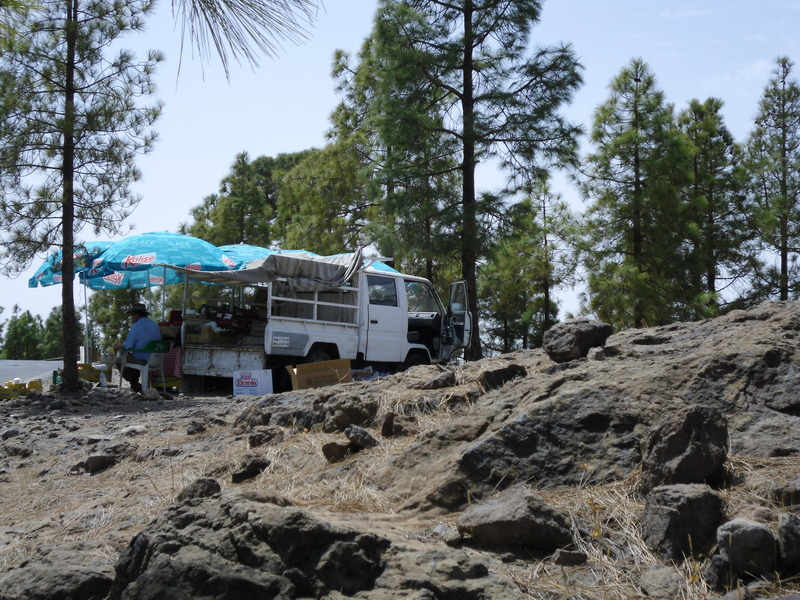 In the middle of nowhere some Spanish man were selling fruit and drinks! We were very exhausted because of the heat and had an orange and a sprite. After a big break in the shadow of one tree we felt a whole lot better and decided to cycle up to the path that was shown in the map. After some kilometres we reached a "relaxing area" with a small beach at a lake. And after some more kilometres we reached the path and met some German people who told us that it would be very nice to cycle this path down to Soria with the mountainbikes. So we continued! The path was really good, but also really bumpy 😀 On the way down we met many sheep and goat. 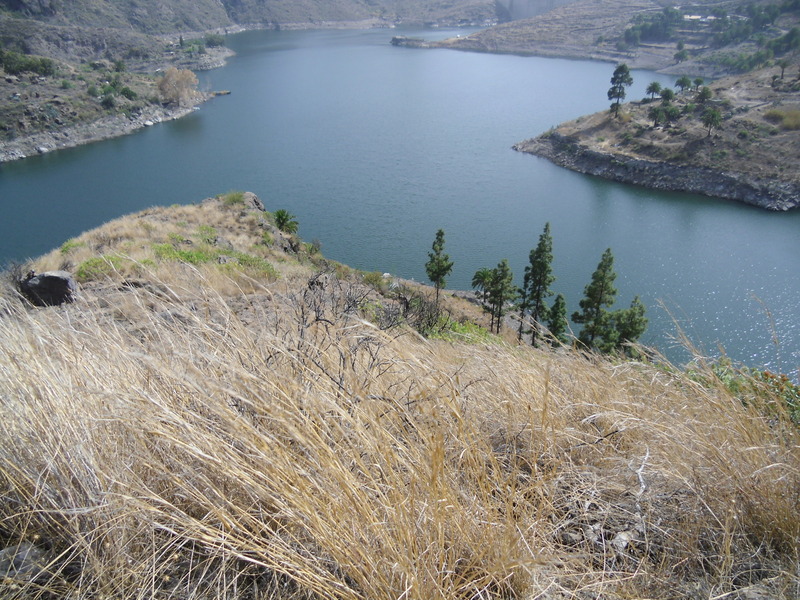 When you come to Soria using this path you have a great view of the lake! 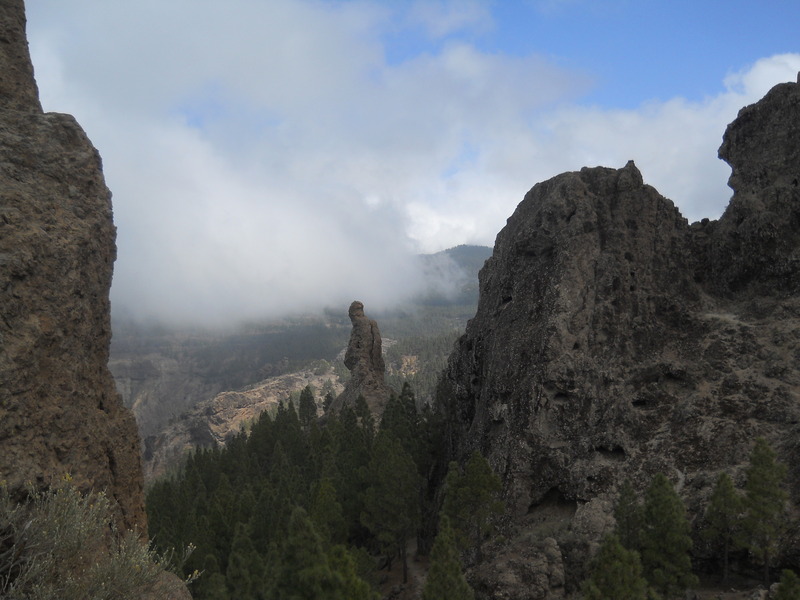 From Soria we continued the well known way down to Maspalomas, all in all this tour is really worth cycling.